Shop AV Equipment From Our Great Selection: Buy Now! What kind of audio visual equipment do you need? 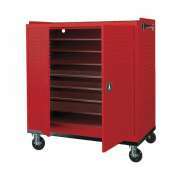 That depends on whether you are outfitting a school or office. Today&apos;s classroom and boardroom require AV carts which facilitate digital productions. No matter what specific equipment you use in your school, community center or office, we offer lots of multimedia accessories.Store and transport digital equipment in our sturdy audio visual carts. Whether you are speaking at a convention or just giving a lesson, we have everything you need to keep things running smoothly. Hertz Furniture&apos;s selection of AV equipment is assembled to satisfy the requirements of modern-day customers. 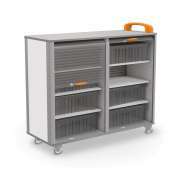 What should I look for in an AV cart?AV carts come in a large selection of materials and configurations. The right choice ultimately depends on what digital equipment you want to keep mobile and accessible. 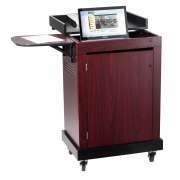 AV carts save the hassle of carrying heavy and unwieldy electronics from place to place. When large equipment is carried manually, there is a greater risk that it will get damaged from dropping or bumping against things. 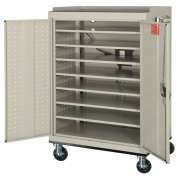 Carts roll everything smoothly into place as it securely rests in tough cabinets or on shelves. Because we know that every institution has a unique set of needs for audio-visual equipment, we have carts in a wide range of styles. Whether you just want a place for your laptop and notes, or you need a DVD player, document camera and projector, we have some great choices. 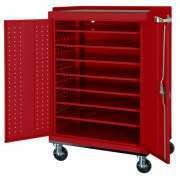 Locking cabinets ensure that electronics are protected even when you are out of the room. With all presentation and slideshow equipment in one convenient place, special lectures and events can be set up virtually anywhere in very little time.What is the most versatile AV cart that can hold my audio visual equipment?Tuffy Carts from H Wilson are sturdy and versatile. They can support virtually any electronic equipment, making it easy to transport just about anywhere. They are available in a huge selection of styles, with multiple caster choices. Cabinet options are available as well. 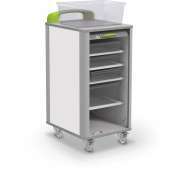 Tuffy carts are distinguished by a selection of great colors that make them easy to find and fun to use. If you just want a place to put a television, we also have a number of excellent TV carts. 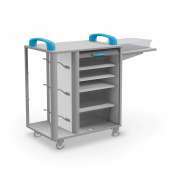 Carts which are designed for flat-panel screens enable sturdy mounting so equipment is secured in place and highly-visible. If you still have classic, full size TVs our carts can accommodate your equipment as well. Where is the best place to store laptops?Many modern schools and offices have a considerable collection of laptops for training sessions or special class lessons. The advantage of laptops is that they can be taken just about anywhere in laptop carts. Laptop charging and storage carts keep these valuable computers secure when they are not in use. When it is time to take them out, they are fully-charged and ready to go. Should I get a sound lectern?Every auditorium and lecture hall requires a lectern or podium. If your rooms can house a large crowd of people, it is important to make sure that the lectern is equipped with the technology to reach large crowds. The most convenient arrangement to have is a sound lectern. With a built-in microphone and amplification system, the speaker won&apos;t have to strain to be heard - even in a very large room. 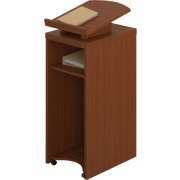 Another great model from the Oklahoma Sound Corporation is the vision lectern. An LCD screen on the front of the podium can display a company logo or photos and slides which enhance a presentation and keep the audience focused. If your presenters prefer to move around as they speak, or you don&apos;t have a built-in sound system, portable PA systems can really come in handy. Models are available with a personal microphone that can be held as the lecturer walks around, or a tie-clip microphone for hands-free operation. 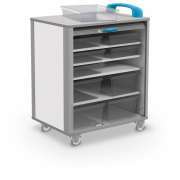 These options are great for the professional and educational settings. Headsets with wireless microphones are convenient when putting on a school play or arranging other performances and special events from behind the scenes. What kind of projector should I get?Every modern classroom, lecture hall and seminar room needs a handy system for displaying slide shows, video clips and other digital presentations. We offer a variety of projector setup options, so you can find the choice that fits every space. Table projectors can be setup anywhere, they don&apos;t require special accommodations. If your institution does not have room in the budget to equip every room with its own wall-mounted projector and computer system, a table projector is helpful because it can be moved around and set up in different spaces as needed. We also have overhead projectors for those who still prefer to print out slides and write on them.Do I need a projector screen?While a picture can be projected onto any plain white surface, the clearest images will result from the use of a projection screen. Freestanding models with a tripod support can be set up in any location. Wall- or ceiling-mounted screens can be rolled down when needed and stay in the same place, so no one will have to go looking around for the equipment when an event is about to start. Tabletop screens can easily be transported in a convenient case. This important piece of AV equipment makes a big difference when you are trying to make a professional impression. No matter what electronic equipment you are using in conjunction with an AV cart or multimedia lectern, having a built-in powerstrip is always helpful. With multiple outlets in easy access, you won&apos;t have to go searching around for plugs, or leave dangerous wires which can cause a tripping hazard running across the room. Having all electronics plugged in right there makes setup and cleanup much faster as well. Hertz Furniture has all of the audio visual equipment you need to bring your company or school into the twenty-first century. With great prices and a huge selection of top-quality models you can furnish any space with great AV tools. If you need help choosing between a few similar models or understanding the unique benefits of special features, contact the experts on our Project Solutions team for free project-planning advice.